Many families are familiar with classic books like Goodnight Moon and read them over and over with their very youngest children. Here are some more recent titles and reissues you and your baby will both love. Ten Little Fingers and Ten Little Toes, by Mem Fox. Illus. by Helen Oxenbury. 2008. Baby Bear, Baby Bear, What Do You See? by Bill Martin Jr. Illus. by Eric Carle. 2007. 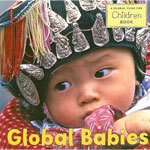 Global Babies, from Global Fund for Children. 2007. You have probably noticed how babies and toddlers are drawn to photographs of other babies. In this beautiful multicultural board book, babies from all over the world are captured in exquisite local clothing—decorative but not fancy. And even more intriguing than their outfits are their faces. These babies—from Mali to Malawi, from Peru to Afghanistan—seem to be “communicating” with the camera, and therefore with the reader. An excellent browsing book for your very young child. I Am a Bunny, by Ole Risom. Illus. by Richard Scarry. 2004. The Rooster Struts, by Richard Scarry. 2004. Mommies Say Shhh! by Patricia Polacco. 2005. Life on a farm can be noisy! Polacco uses lilting, repetitive language and rich watercolor illustrations to show various animal families and the sounds they make. “Dogs say buff, buff, buff. Sheep say baa, baa, baa. Geese say honk, honk, honk. Bunnies say nothing at all.” And what happens when all the animals speak up all at once, causing quite a ruckus when a baby is sleeping nearby? 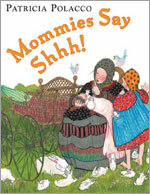 “Mommies say shhh, shhh, shhh.” A great read-aloud where you can invite your little one to chime in. Bears, by Ruth Krauss. Illus. Maurice Sendak. 2005. 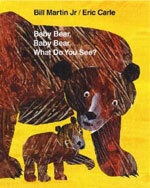 Bears, written by Ruth Krauss and illustrated by Phyllis Rowand, was first published in 1948. Maurice Sendak was still an undiscovered artist at that time, but he and Krauss soon became close friends and collaborators. In this reissue, Bears has new illustrations by Sendak. Krauss’s charming story about bears and their fantastic habits now has a new twist. In addition to illustrating the bears, Sendak added a subplot: Max, the white-suited character from Where the Wild Things Are, can be seen searching for his dog, who has snatched one of Max’s teddy bears. This is a piece of literary history and a seductive read for children. ¡Pío Peep! 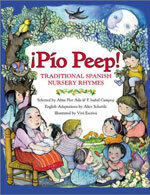 Traditional Spanish Nursery Rhymes [Rimas Tradicionales en Espanol], selected by Alma Flor Ada & F. Isabel Campoy. 2003. English adaptions by Alice Schertle. Illus. by Viví Escrivá. “The words of nursery rhymes and songs gave both wings and roots to my soul,” says Alma Flor Ada, one of the book’s editors. ¡Pío Peep! compiles 29 rhymes and nursery songs from Spain and Latin America, lovingly selected favorites of these regions’ cultures. Accompanying English versions capture the essence and the beauty of the rhyme, so both English and Spanish versions are poetic and rhythmic, just as nursery rhymes should be. Having only one rhyme per page, with beautiful illustrations by Viví Escrivá, is age appropriate, without too many visual distractions or clutter. The watercolor illustrations have just the right amount of detail for young children. You will have fun introducing these nursery rhymes to your youngster. 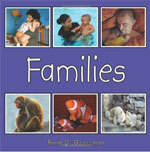 Families, by Rena D. Grossman. 2009. This nonfiction board book highlights the common ways humans and animals take care of their babies. “All families give kisses . . . share snacks . . . take baths, take naps, and say ‘I love you.’” Each double-page spread juxtaposes a human family and an animal family taking part in the same activity. The photos are clear and expressive, and who doesn’t like to see families taking care of their adorable babies, whether human, giraffe, or hippo? Families is an excellent introduction to the connections between all members of the animal kingdom. 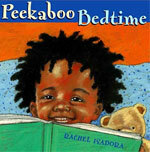 Peekaboo Bedtime, by Rachel Isadora. 2008. Hello, Day! by Anita Lobel. 2008. Nobody does color like Lobel, and she devotes an entire page to the illustration of each of the farm animals featured in this day in the country. Painterly renditions of a cow, a sheep, a horse, and more are accompanied on the opposing pages by simple language describing what each animal “says” (moo, baa, neigh). 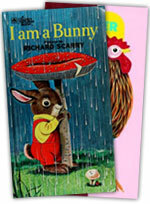 Your young children can practice animal sounds as you read together. Lobel’s twist—telling readers what the animals are really saying—lends an element of discovery and delivers a satisfying wrap-up to the colorful day. 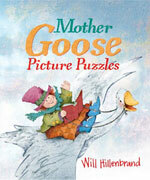 Mother Goose Picture Puzzles, by Will Hillenbrand. 2011. With 20 familiar rhymes on 40 pages, this Mother Goose collection covers the basics and accomplishes a lot more. Each rhyme is illustrated on a generously sized double-page spread, giving young children large close-ups of all the beloved Mother Goose characters. Humorous and folksy illustrations capture characters in happy-go-lucky (Peter, pumpkin eater), disheveled (Jack and Jill rolling down the hill), shocked (Little Miss Muffet), and oblivious (Little Boy Blue) states. Although wonderful to read to babies and toddlers, older children will also enjoy the rebus puzzle component: about one word per line in each rhyme is replaced with a picture that must be “read” as part of the text. In the first line of “Little Boy Blue” (“Little Boy Blue, come, blow your horn!”), a picture of a horn replaces the word horn. Because of the nature of the illustrations and the rebus puzzles, this book can be enjoyed by the whole family. My Farm Friends, by Wendell Minor. 2011. “Welcome to the farm,” Wendell Minor writes in the opening to My Farm Friends, warmly beckoning readers. Each turn of the page introduces one or two farm animals and teaches interesting facts and habits about each one with humor and rhyme. “Pigs can’t sweat / Or jump in a pool / So they roll in the mud / That’s how they stay cool.” Wendell’s love of animals will be clear when you read the book’s dedication, in which he reminisces about loving his family farm as a child. Children will see the care he has put into illustrating each animal. He captures a pig’s knowing glance, a sheep’s tender nuzzle of her lamb, and the gentleness of a goat’s droopy eyes and soft lips as it chews a stolen bandana. You can share with your children the additional fascinating facts about the animals found at the back. Source: Book descriptions adapted from The Reading Chair column that has been published in each issue of Young Children since 2005. Isabel Baker has been writing the column since 2005, and Miriam Baker Schiffer joined as coauthor in 2007.